Fix It and Finish It is in a different city every day helping families in need with their homes, cabins and RV's needing a makeover inside and out. Host Antonio Sabato Jr and his team of designers remake a complete room in just one day. While the host, Antonio Sabato Jr., is well-known to soap-opera fans, he seems more like eye-candy than an expert in home improvement. In the show's intro, he says, "Renovating is what I do." No, Antonio.....acting is what you do, and this show only highlights that. Really, could the t-shirts Antonio is wearing be any tighter? Everyone on the job site is casually dressed, dirty, working hard, and he jumps in to scenes to look like he is working, but it is obviously staged, he never gets dirty, and his dialog is childishly simplistic and uninformed, pointing out obvious details like, "Here is the piece we removed. We cut it. And now this is where the sink goes." Wow....gee....thank you for telling me that, because I didn't understand that confusing scene where they were cutting a big hole in that granite countertop, Antonio. Even his so-called injected "tips" are not eye-opening or ground-breaking home improvement instruction; by the end of the first episode, the fact that he keeps introducing himself with his full name, "Hi. I'm Antonio Sabato Junior" gets really annoying. Yes.....we know who you are already. The show seems designed to be as HGTV-esque as they can, but in reality, it feels more like a cheesy infomercial, meant to mainly advertise contractors and products. 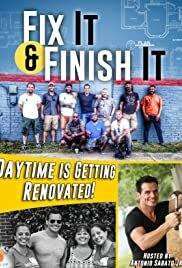 While the episodes are geared towards doing something nice for a well-deserving home owner, this show lacks a real connection to the home owners or any semblance of home repair instruction that viewers can take away to apply to their own homes. Overall, the show feels unprofessional, the host is goofy, and as a home-improvement show, it lacks teeth.